Hello again! I thought you might like to see some pictures from the QVC Craft Party event that I was at last week. I headed down to London on Wednesday and met up with Kathy and Jayne from Personal Impressions who were already busy getting out Make n Take and display tables ready. The whole room was decorated with bunting, pretty china cups, saucers and cake stands filled with fairy cakes. Very pretty. Here's the Personal Impressions display table complete with Martha Stewart goodies and two lovely Charlie Bears....I did wonder if the cupcakes would be safe in their paws! We also set up the workshop room where I'd be teaching twelve classes over the next two days. We were up bright and early for the first day of the event and Craig was there to welcome everyone and get them in the mood for crafting! Craig also introduced everyone...Marion Emberson, Imaginations, Michelle, Stix 2, Amy, Julie Hickey, Sizzix and everyone else that I've missed off my list. On the second day, new presenter Anna was there to do the honours...she was lovely and made a really excellent card on my workshop. Then it was time for myself and Jayne to lead our first group to the workshop where we would be making our "Winter's Tale " cards. We only had forty five minutes for each session, so had to get straight down to making a Distress Stain and Perfect Pearl Mist background, before stamping, masking, bleaching, colouring, cutting out and sticking everything together! Whew! Everyone did really well - even when, on the second class, Craig joined us and sang "Only a Winter's Tale" throughout! Bless him!??? Jayne and I scurried around, making sure that everybody knew where they were up to, and, with only twenty minutes between each class, we didn't have much time to spare! Here are a couple of the ladies carefully painting the fences, owls and postboxes for their cards. This is the lovely lady who had me in Stitches at the session that she attended...I've never seen anyone applying ink and stamping with such a lovely flourish and her laugh was infectious! A couple of the ladies went "off piste" so to speak, and used the techniques and the stamps etc to just have fun doing their own versions. This card was just gorgeous, with a very ethereal look to it. And this lady got really into the spirit of stamping and made her own version too. After twelve workshops Jayne and I were all in, but everyone's enthusiasm had made it all worthwhile - even stamping and cutting out 120 post it note fence masks was worth it (I had been going to stamp one each - 240 - but I caved in and people shared!!!). Here's a picture of Craig drawing tickets for one of the raffles that were held over the two days. Great prizes were up for grabs, as well as tours of the QVC studios and behind the scenes in the craft prep room etc. How I would have loved to have won one of these Charlie Bears....but, of course, I wasn't even in the running for prizes. How cute is this chappie though...look at those pleading eyes! So, there's a mini round up of the Craft Party. It was a great chance to meet so many keen crafters and I hope you all went away having had a fantastic time at a memorable event. I got home very late on Friday night and on Saturday I was off to Samuel Taylor's in Brighouse, Yorkshire. I was feeling very tired but, thankfully, everyone that came to my demonstration was so jolly and we did so much laughing, that they soon energised me and the day flew by. A special hello to Claire and to Diane who was teaching a workshop where the ladies made a beautiful birthday cake card. 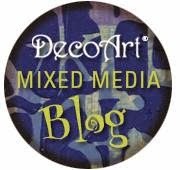 Take a look at Diane's blog, Inky Meanderings for more of her lovely work. Here's one of my cards from Saturday, using the same stamps as the QVC workshop, but with Distress inks instead of Stains for a softer feel to the scene. Lastly, don't forget that it's Craft day on QVC this Thursday (ie starting at midnight Wednesday through to midnight on Thursday). I will have some stamp sets on air, including new ones. And, really lastly, I also have a new set of projects, featuring penguins, in the latest issue of Crafts Beautiful magazine. I am now off to give my typing fingers a rest! PS don't forget to read my previous post as I have done two in quick (?) succession!